The foregoing information was obtained from the Southwest Montana Multiple Listing Service and while deemed reliable is not guaranteed. Independent investigation before purchase is recommended. Price and availability subject to change without notice. Statistics do not include Yellowstone Club sales. A side-by-side comparison of all real estate sales in Big Sky, Montana from January 1st through March 31st in 2017, 2018, and 2019. Comparison of real estate sales by property type in Big Sky, Montana from January 1st through March 31st in 2017, 2018, and 2019. Property types included are Single Family Homes, Condominiums and Land. YOUR TRUSTED EXPERTS FOR Big Sky REAL ESTATE. YELLOWSTONE NATIONAL PARK IN OUR BACKYARD. 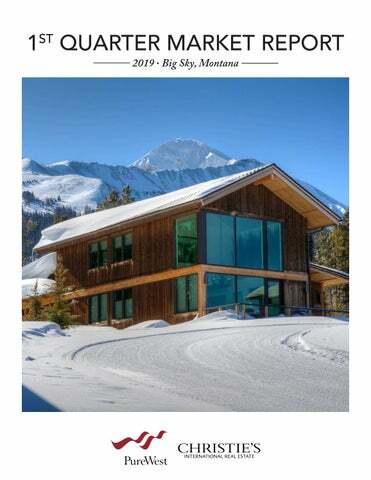 A look into real estate trends in Big Sky, MT from January 1st through March 31st, 2019.